Kinsey meets her new hero, Lauren Brewer Bass. y just has an affinity for characters. Last week my husband and I brought both of our daughters to Cooperative Baptist Fellowship’s General Assembly in Dallas. We began our week at Baptist Women in Ministry’s annual worship service. Squirming Kinsey sat on my lap as the service began. After a few minutes, Pam Durso introduced a young woman who would be supported by the Carolyn Weatherford Crumpler missions fund. As the young woman got up to speak, I whispered in Kinsey’s ear, “Shh. Please be quiet right now. This is mom’s friend Lauren Brewer Bass and I want to hear what she says.” Kinsey quieted down and listened carefully…and then proceeded to continue fidgeting once Lauren was done. Later at BWIM’s luncheon Kinsey also heard Pam say that Lauren had written a book and would be signing copies after the lunch. On her way out, Kinsey quietly made a note of how neat it looked for people to stand in line and have Lauren sign their books. When we arrived at the hotel just hours later, Kinsey spotted a banner with Lauren’s picture on it and shouted, “Hey, look! It’s Lauren Brewer Bass!” Then, she heard my husband and I talk about how Lauren and her husband, David, would be commissioned as field personnel during the Wednesday evening worship service. 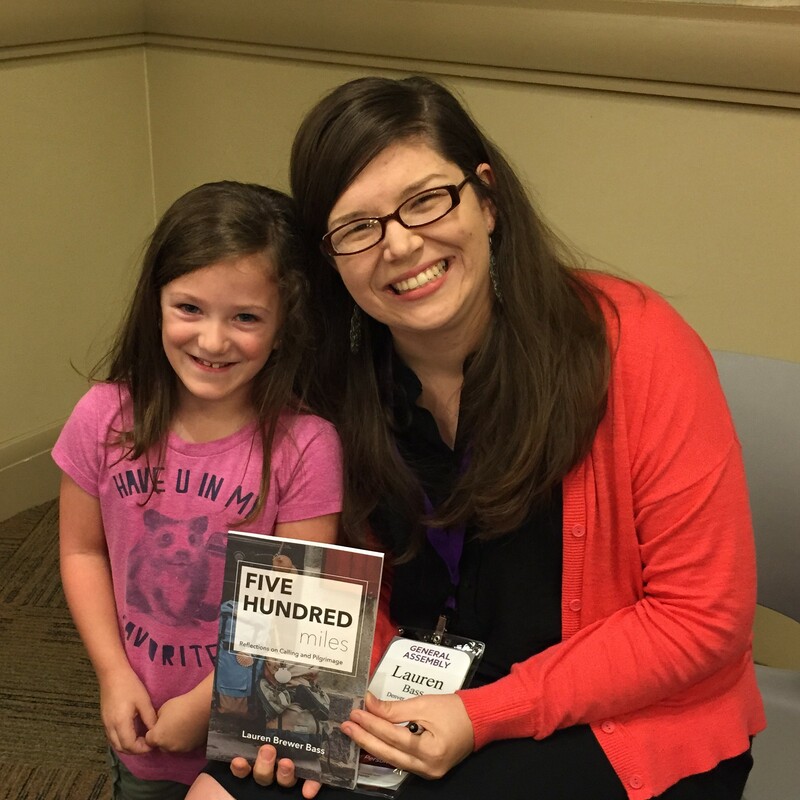 Kinsey had found a hero—a character—for her CBF trip. For the next 48 hours I heard the name “Lauren Brewer Bass” over and over. Once Kinsey realized that Lauren was moving to Cambodia to be a missionary she was a little concerned that she wouldn’t be able to see Lauren much, but she still chanted her name, “Lau-ren, Lau-ren, Lau-ren,” as we waited in line to get a picture with Lauren at Smyth & Helwys’ book signing on Thursday night. I am so grateful to be a part of a Fellowship that has characters like Lauren Brewer Bass. Baptist Women in Ministry and the Cooperative Baptist Fellowship are places where a 7-year-old girl can find heroes who write books, sign books, have their pictures on banners and even go to Cambodia to share God’s grace and hope. You can buy Lauren’s book, 500 Miles from Smyth & Helwys, here, or learn more about Lauren & David’s work on their blog. My family will be supporting Lauren & David in their ministry and I will keep Kinsey updated on all things “Lauren” in the years ahead. You also can give to support Lauren and David as well as other CBF field personnel here so that little girls and boys around the world can find characters and heroes worth standing in line for and chanting about. Learn more about Lauren and David’s ministry in Cambodia in the video below. New CBF Field Personnel from Cooperative Baptist Fellowship on Vimeo. Meredith Stone is director of ministry guidance and instructor of Christian ministry and scripture, Hardin-Simmons University, Abilene, Texas.